Polls Operation is the journalistic chronicle of the clandestine operation that allowed October 1st, 2017 in Catalonia, to have ballot boxes at the polling stations so that the referendum of self-determination could finally be celebrated. Based on the testimony of the brains of the operation and its main characters, the reader will discover an incredible story that surpasses any fictional one. Thousands of volunteers organized themselves in a secret and pyramidal way made it possible for the most precious treasure to reach its destination. A story that will undoubtedly remain forever in the collective memory of many generations. «All the ballot boxes that Spanish Police has stolen us are mine», says Lluís, the operative brain that allowed 2.229 polls to be authorized for the referendum of self-determination on October 1st. He was chosen as the logistics coordinator of Polls’ Operation. The most valuable treasure sought by the Spanish security forces and the most desired one for millions of Catalans who wanted to exercise their right to decide on October 1st. 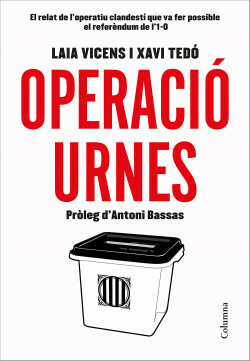 The story of the clandestine operation that made the referendum of October 1st in Catalonia possible. Because there is no referendum without a ballot box. That’s it.